Participation rates in Sam Houston State University's Faculty/Staff Annual Fund campaign have set a new record with the majority of the year yet to go and donations still being accepted. Cindy Truax, assistant director of development, said at an appreciation luncheon for the campaign that the volunteers deserve a great amount of credit for the result, and special thanks for their efforts. 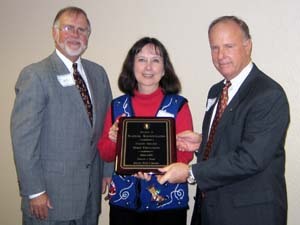 Laverne Warner, co-chair of committee, said that 41 percent of SHSU employees (538) have already contributed. Last year's participation rate for the entire fiscal year was 38 percent. Warner said that the average gift for the five-week "active" campaign that ended Nov. 8 was $141, compared to $126 last year. With many employees giving through payroll deductions, and with the participation rate increase, it is assured that this year's total by year-end will exceed the $115,000 raised last year. James F. Gaertner, Sam Houston State University president, congratulated the volunteers on their results. He said that high employee participation in the annual fund is an important signal to those who will be asked to give to the university's first capital fund campaign. 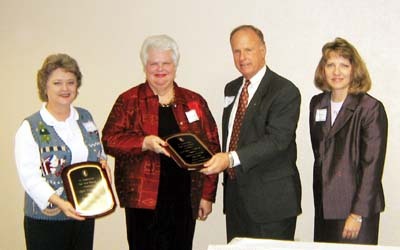 Gaertner and Truax presented plaques to the committee co-chairs, Laverne Warner and Joey Chandler, and awards to other university entities that led in several categories. The College of Education raised the most dollars ($20,628) during the campaign for the second year in a row, and also has 27 out of the university total of 118 participants on the payroll deduction plan. During last year's campaign 70 employees signed up for payroll deductions. The College of Business Administration came in with the highest percentage of donor participation among colleges with 63 percent of their faculty and staff contributing. Three divisions that reached 100 percent participation were also honored. These were academic affairs, the president's office, and the advancement division. Campaign committee members were presented certificates of appreciation. They included Dorothy Roberson, Bill Fleming, Bobby Lane, Karen Whitney, Rick White, Carol Shaw, Bill Green, Cutty Gilbert, Wes Johnson, Sherry Hirsch, Diana Nabors, Carol Parker, Jerry Bruce, Brenda Boeske, and Donna Desforges. Also, Debbie Stubbs, JoellenTipton, Teresa Ringo, Nina Cooper, Renee Starns, Jacque Gilliam, Marsha Dickens, Kathy Gilcrease, Chris Park, Donna Artho, and Keith Jenkins. 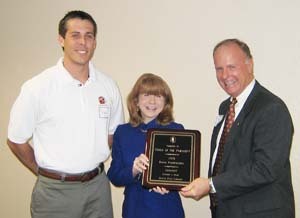 Plaques were presented to Joey Chandler, left, and Laverne Warner, left center, co-chairs of the Faculty/Staff Annual Fund Campaign, by James F. Gaertner, SHSU president, and Cindy Truax, assistant director of development. 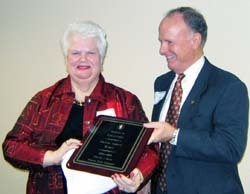 Laverne Warner, representing the College of Education, accepted an award from James F. Gaertner, SHSU president, for the most dollars raised during the "active" portion of the Faculty/Staff Annual Fund Campaign. 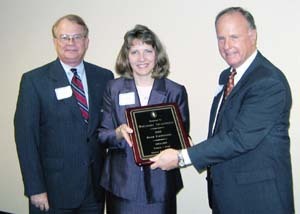 Bill Greene and Carol Shaw received a plaque from James F. Gaertner, SHSU president, honoring the College of Business Administration for the highest participation rate among colleges in the Faculty/Staff Annual Fund Campaign. 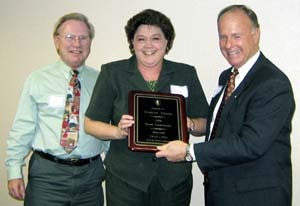 Awards were also presented to three offices with 100 percent participation. Accepting on behalf of each were Bill Fleming and Dorothy Roberson, top, academic affairs; Chris Park and Kathy Gilcrease, center, president's office; and Frank Holmes and Cindy Truax, bottom, advancement.